The TD44 Tower makes for an excellent vertical truss that allows the safe, quick lifting of regularly loaded horizontal HD/ FD44, FT, XT and TT Truss Rig and Roofs to their service height. In terms of static, the TD44 Tower is designed for a high fle- xural- and pressure strain. Especially due to a roof this high, flexural strain is required. A new multifunctional top part for use of manual chain hoist as well as motorized hoist has been redesigned and built stronger. TD44 Tower Truss is a square 40cm (1,31ft) heavy duty truss with one on side integrated horizontal bracing for safe and easy climbing. 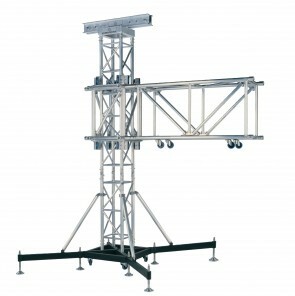 Naturally this TD44 Truss has been made according DIN 4113 and approved by TuV. A strong, safe and cost effective solu- tion to erect the TD44 Tower. The hinge sets are 100mm (3,94in) long. Those half connectors with a hinge fork allow a very high vertical load. 4 Hinge sets (2 left and 2 right) are required per tower. Standard sized XT and TT corner blocks with usage of 2 bolted sleeve plates guarantees a perfect geome- tric rig. These blocks make it possible to fit the TT / XT / FT100 Truss to all four sides by using bolted receivers. The upper sleeve plate is equipped with an integrated hanging point. Steel Base on wheels available with short outriggers and long outriggers in combination with stabilizer bars.